Year 1S OLC: Bug Catcher Bonanza! On Friday between recess and Year 1R and Year 1P tackled the challenge of creating their very own bug catchers. After weeks of planning and designing their own creations, the children were delighted to be able to finally put their ideas into action! 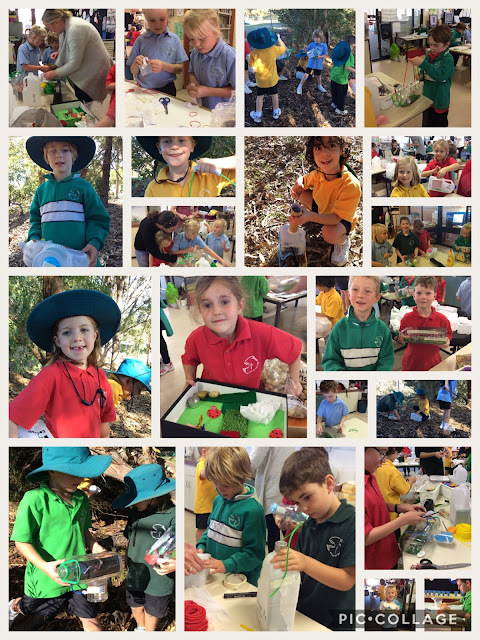 We are very thankful for all of our hands on parent helpers who gave up part of their Friday to sticky tape, hot glue and assist with refining the Year 1's designs. The project would not have happened without you! After lunch, the Year 1's set off on an expedition into the bush to find as many bugs as they could. We came across a number of bees, spiders ants and one VERY LARGE bull ant. We discussed how we need to be safe when hunting for bugs, as well as how we also have the option of setting our bugs free after viewing them in our bug catchers. We hope you all had a lovely weekend exploring, hunting and collecting bugs!